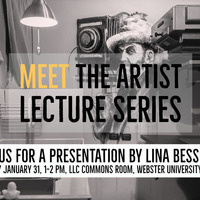 Webster alumna Lina Bessonova is a Russian-born analog photographer and printer based between Monaco and Italy, and owner of a photo lab in Florence. Coming from a background of PR and Media Communications, she committed to her passion for film and graduated with an MFA in Photography degree in 2017, publishing her first book “At Home” the same year. Lina offers workshops, individual courses and guest lectures on film photography and darkroom printing, and is currently working on several commercial and personal projects to be released in 2019.